The second disc presents a 68-minute audio documentary on the musical roots of the Requiem written by the renowned Mozart scholar Cliff Eisen, featuring musical examples from the Requiem and the works from which it draws inspiration whilst highlighting striking similarities between Mozart’s work and that of several contemporaries and predecessors. Recorded in the Chapel of King’s College, Cambridge, by kind permission of the Provost and Fellows, 26 & 27 June and 27 September 2011. Recorded at 96kHz 24 bit PCM. Audio dialogue recorded at Voiceover Soho, August, September & November 2012. 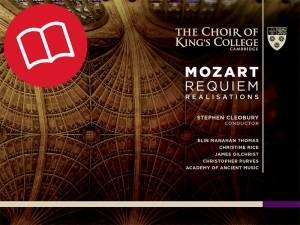 Excerpts recorded in the Chapel of King’s College, Cambridge, by kind permission of the Provost and Fellows, September 2011.